Lithograph by Jonathan Needham (fl.1850-1874) of the ferry on the road from Manaar to Colombo in Sri Lanka, dated 1st January 1864. This print forms plate 7 of 'A series of fifteen Views of Ceylon illustrative of Sir J.E. 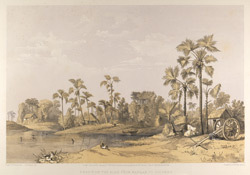 Tennent's work, from sketches made on the spot by Capt C. O'Brien, late Assistant Surveyor General, Ceylon', London, 1864. The text accompanying this print is a quote from Vol II of Sir J.E. Tennent's 'Ceylon, &c.' and describes the Palmyra Palm (Borassus flabelliformis). Part of it reads, "These valuable trees flourish in great topes and forests, which cover miles, in various parts of the peninsula and the adjoining island (Jaffna). Their broad fan-like leaves, though inferior to the gigantic talipat, are more gracefully arranged around the stem, which towers to the height of seventy or eighty feet, though the average is somewhat less. Unlike the coco-nut palm, whose softer and more spongy wood bends under the weight of its crown of leaves and and fruit, the timber of the palmyra is compact and hard, so that the tree rises vertically to its full altitude without a curve or deviation. No object in vegetable nature presents an aspect of greater luxuriance than this majestic palm when laden with its huge clusters of fruit, each the size of an ostrich's egg, of a rich brown tint, fading into a bright golden at its base."